I have had the opportunity to meet President Clinton numerous times since I started collecting back in the 1990’s. The first time was in 1996 when he spoke before our trade association at a meeting in Washington, D.C. He was very generous with his time and his pen back then. I remember telling my associates at the meeting that it was my first time meeting a sitting President and I was very impressed with his demeanor. He shook hands, took pictures and signed items for over 45 minutes after his speech ended. 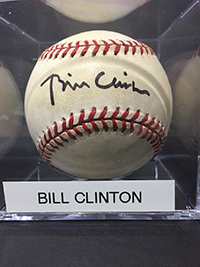 I still have the baseball he signed for me that day as my primary Bill Clinton signed baseball since he signed it as President. Since then – I have seen Mr. Clinton probably a dozen times at some fundraisers, receptions and rallies. He has always been an incredible signer and has always taken the time to see that everyone got their requested autograph. Recently A few years ago I attended some very intimate Congressional fundraising receptions where Mr. Clinton was the special guest. I knew that this was my opportunity to have him sign something very special for my collection. Then it dawned on me – what would be the best item to complement my collection of signed baseballs – a baseball bat! I ordered an official bat and had it engraved prior to the reception in New York City. 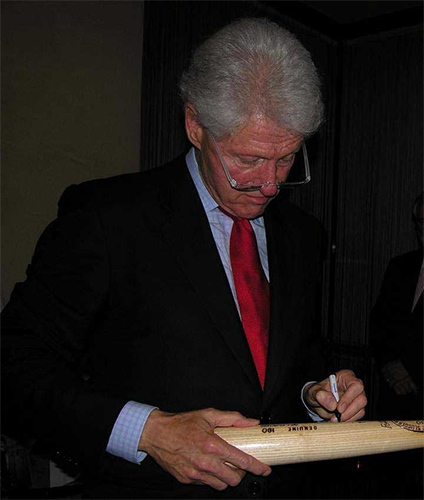 I knew that getting a President to sign a bat is not easy so this would be my chance. Sure enough President Clinton was great and signed it beautifully.